In thinking of ways to make the posts a little different, I decided to do a Shop the Look Friday post for you gals today. My plan is to post every Friday with the most popular look of the week or any look that you want ideas on. This week, one of my all time favorites and I think yours was this little yellow number from yesterday's post. I love the idea of revamping items in my closet from the last seasons. It is almost like finding new things and you can totally get a completely different look by simply being just a little creative. 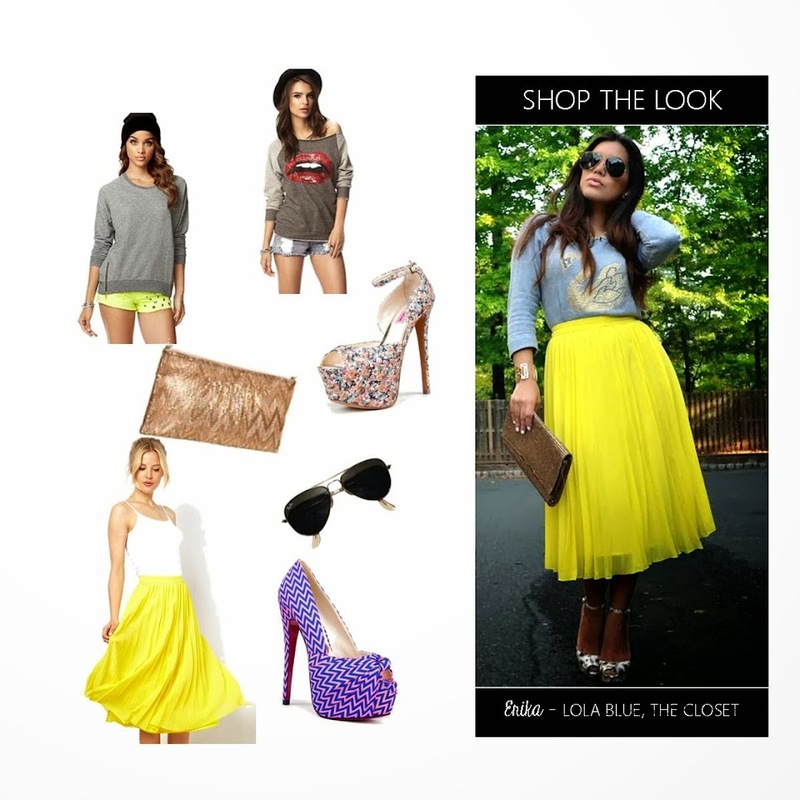 For this look, I wore this amazing chiffon skirt from ASOS with this cute gray sweatshirt, this is a similar one but you can pretty much pair it with any embellished or fun graphic sweatshirt. The shoes were a completely steal from Zara a couple of month's ago, I paid just $29.99, I couldn't pass them up. They are simply amazing. You can see better pics of them here. I couldn't find the same exact ones for you online but here is this cute option as well as this one. Add this chic gold clutch and Raybans and you are ready to go! Here are the direct links to each piece... Happy Friday chicas and have a fun weekend! 4. BCBG Gold Clutch or this cheaper option, that's perfect too! If you would like to see more posts like these, please leave a message below. I have been thinking of different ways to change it up a little around here. Have ideas or need suggestions, comment below, I read all your lovely comments and as always am so grateful for all the love.